When I got a facebook message from Ben saying, “Hey Winston, it’s been a while! Love your photos! I’m getting married. 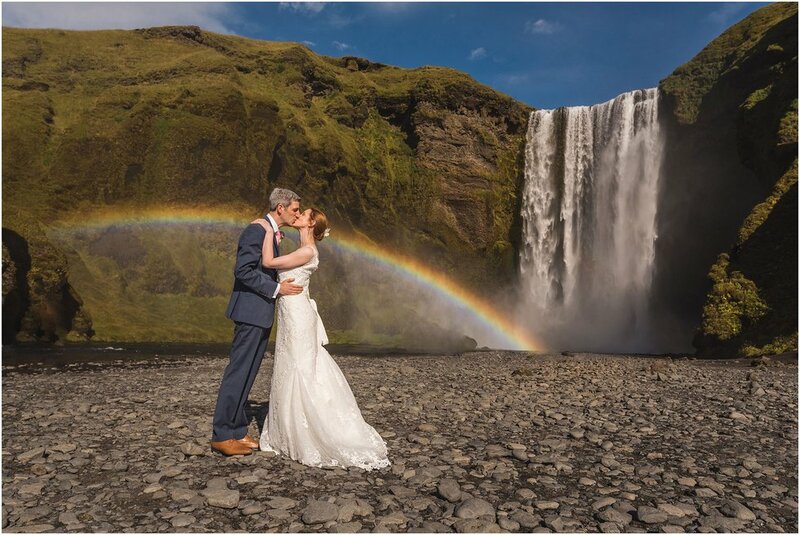 Fancy being an Iceland Wedding Photographer for the day?” I couldn’t reply quick enough! Ask any wedding photographer their Top 3 dream destinations for shooting a wedding and I guarantee 9 out of 10 of them will have Iceland in that list. Iceland is truly stunning and a photographers playground. On meeting up with my old Uni friend and his lovely fiancée Helena, they treated me with further gifts, “We’re getting married behind a waterfall,” Ben declared whilst carefully watching my reaction. “Really?! Behind a waterfall?” I replied unable to hide my excitement! It was like 10 Christmas days all rolled into one! 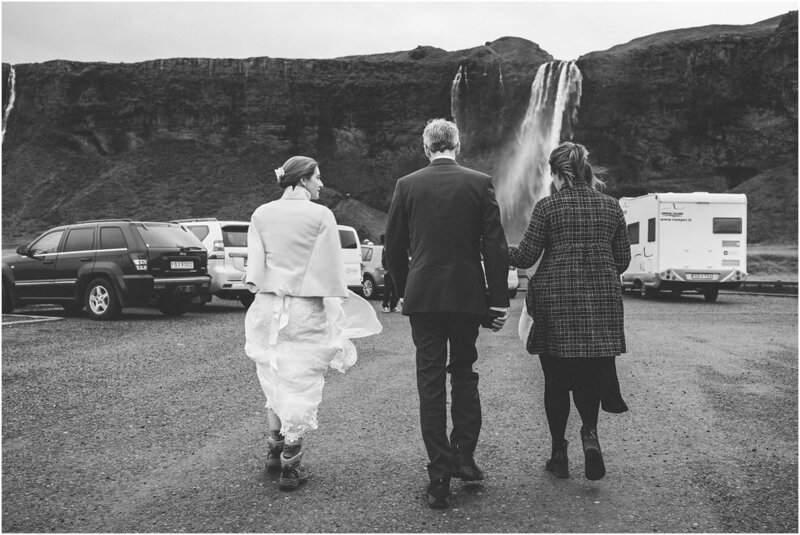 In the end they decided to get married in front of a waterfall (Seljalandsfoss to be precise) as it was a bit wet behind it, but the end result was the same – just the two of them + an Icelandic registrar and me happily snapping away as they exchanged vows with the most amazing wedding backdrop ever! I couldn’t hear a word of what they were saying as the water plummeted down a whopping 60m just behind them. Regardless, I still had a tear in my eye. This was my first elopement and I instantly fell in love with the concept and understood why they had chosen to do it. Marriage is after all a very private thing and they were starting it as they meant to go on – with intimacy and exclusive companionship. I don’t want to sound too gushy, but it was just beautiful and they also had the benefit of celebrating with their friends and family when they got home to London a week later! The best of both worlds! I had offered to not only be their photographer but chauffer too. 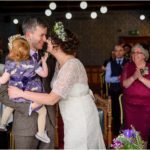 This gave them the freedom to explore the surrounding area after the ceremony and visit a number of stunning locations in the Golden Circle area at their leisure. From a grey (yet beautiful) start to the day it transformed into a glorious sunny day by the time we reached Skógarfoss, another 60m drop but this time with a rainbow adjoining the cascades! Minds completely blown we decided to calm the excitement down for a few minutes, re-group and have a cup of tea before moving on. We are British after all. Our next destination was the Reynisfjara pebble beach where the famous natural rock formations are found. We had fun taking shots in the nearby cave, along the beach and of course on the hexagonal basalt columns. This was followed by an impromptu trip to the Sólheimajökull glacier which was as colossal as it was stunning and handily close to the main road which was a big bonus! Helena’s favourite spot, the geysers was the final stop on our itinerary. I don’t think I’ve ever seen anyone smile so much! 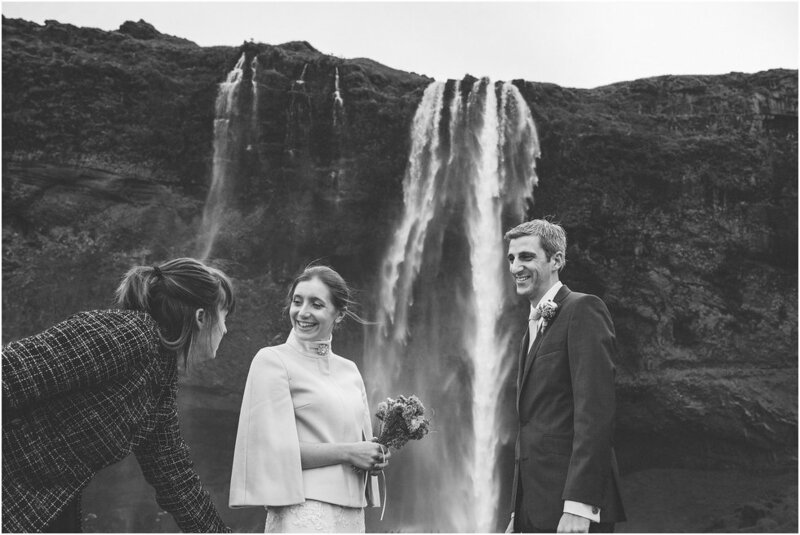 It truly was an unforgettable day and I can’t thank Helena and Ben enough for asking me to come along and be their Iceland Wedding Photographer for the day. It was incredible. The night after the wedding I was treated to a spectacular light display… Check out my Northern Lights Photographs. 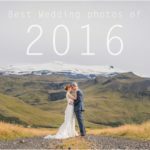 You might also like my Best Wedding Photos of 2016 blog post for my favourite images of 2016. More than one or two of these Iceland shots unsurprisingly made the shortlist. Here is a Ben taking a couple of snaps of me in the freezing cold river as I set up one of their waterfall shots. What you can’t see is his huge grin as my feet rapidly became numb!